Since I began my spiritual journey to find inner peace and health, I have discovered several good Cd’s and software that seem to help me focus and reduce anxiety. Neuroprogrammer 3 –Not really a CD but a brainwave entrainment generator that runs on your computer. I have used this to make my own Cd’s or to use on my Iphone. There are presets for different issues including fibromyalgia, depression, etc. I like this software and find it helpful but I miss not having music or a soothing voice guiding me through the process. However, you can add your own affirmation or music to the generated tones. Depending upon the preset chosen, The Neuroprogrammer 3 is very effective at reducing anxiety and allowing me to “zone out”. A definite best buy. Mind Lab Music-Mind Mandala– This relaxing ten track CD is full of swirling synth sounds coupled with gently plucked guitars. Many of the tracks have an Asian and Indian feel which help create a mysterious calming mood. I also enjoyed the two guided meditations though I was a little distracted by the occasional popping noises when the guide spoke. My favorite tracks were ” Morning Meadow” and “Daybreak” and I often fell asleep listening to these tracks. This is a great CD to play in the background when you are reading or just want to relax. You can listen to samples and download the music at this link. Liquid Mind-Any of the CD’s. Liquid Mind ® is the name used by Los Angeles composer Chuck Wild. I downloaded a free sample and fell in love with his music. Every track on his CD put me into a trance-like state and I felt extremely relaxed after listening for 5 minutes. I tried most of his albums and cannot find one that does not have a soothing, anxiety reducing effect on me. The music gently floats and lulls you into a restful state. If you are suffering from anxiety or just want to listen to some super chill-out music then check out Liquid Mind. Highly Recommended. Kelly Howell-Brain Sync – She has a very soothing voice with beautiful music and the guided meditation imagery is excellent . 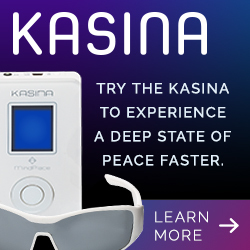 She also incorporates brainwave entrainment technology to induce delta and theta states needed for deep meditation. I downloaded the Cd’s from her website and have been listening to them before I go to sleep. I definitely seem to remember my dreams more and have also been using the “Healing Meditation” CD for nerve pain. These Cd’s requireHeadphones. Meditainment– I subscribed to this last year and have downloaded many different guided meditations for a 6 month subscription fee. These guided meditations have very creative imagery and I really like the British accented guide. They also added video meditations to their lineup with colorful changing shapes that morph in to mesmerizing flower-like images. Apparently, US Air and other airlines offer these meditations as inflight “entertainment”. These meditations do not incorporate any brainwave entrainment sounds. Deepak Chopra-Soul Of Healing Meditations CD – I like the eastern music combined with the voice of Deepak Chopra to create a calming peaceful feeling that helps me with any physical pain that I feel. Incorporates some eastern mysticism/religion into the meditations. Instant Calm: Guided Meditations to Train Your Brain and Calm Your Emotions – Great Cd for people who are new to meditation. Includes beautiful piano music with guided meditations by Rebecca. She introduces some counting technique exercises, progressive relaxation, and positive affirmations that are very helpful and calming. Doc Childre’s Heart Zones CD– I downloaded this from the Heart Math website. The music is really dated sounding. Reminds me of video production music used in the 80’s. Somewhat relaxing but could not get over the music. Vuvee.com brainwave entrainment Track– I created this Track myself with binaural brainwave entrainment tones, soothing music, and ambient beach sounds. It is 20 minutes long and you can listen free here. Make sure to use stereo headphones with your eyes closed. You will find yourself extremely relaxed after listening to it. Comments are welcome. Due to increased bandwidth usage, If you want to download this mp3 file to burn a CD or listen in your iPod please donate $1.25 and I will email you a download link to the 20 minute track. Healingwheel.com – FREE downloads of affirmations and two guided meditations. The music is guitar based and is very pretty. I particularly like the “Alignment” meditation. There you have it.. my current list of relaxation/meditation CD’s. Most of the sites have demos so you can hear before you buy. Previous articleLet there be light. Do you know of any brainwave training cd’s you can recommend: The first one I saw on the net was “EquiSync Brainwave CD” at eocinstitute.org and another one from Centerpointe Research Institute called “Holosync”? Have you tried these products? I used a trial product of the Holosync CD and it worked fine. I would highly recommend the Neuroprogrammer 2 software which generates the tones live and has many presets for different conditions. A much better value than CDs. You can also burn CDs from this software. I also tried brainsync and those worked very well. However,like holosync, if you want to try different brainwave states you have to buy another CD. I am glad it worked well for you. I prefer using my DAVID PAL because it has many different sessions and light goggles. However, if anyone else is considering buying CD’s I would recommend the Neuroprogrammer 2 instead. I use the software at work and it has 20 or more real time sessions or you can burn your own CD from them. It is a much better value than buying single CD’s that may or may not work. However, if you find something that works stick with it! I’ve been searching various forums for info on these meditation programs, and on 4 or 5 of them I see the exact review from above from annita pieroni ALL from august 7th or 8th. This suggests it is a paid review from the Equisync co, and can be summarily dismissed. That being said, I may try it out anyway and hope they honor their money back guarantee if it doesn’t work.. or doesn’t work well. I would treat ALL internet reviews/comments with EXTREME skepticism if I were you. I have used Hemi-Sync CD’s in the past. Hemi-sync was developed by Bob Monroe who was a pioneer in brain wave entrainment and Obe’s (Out of body experiences). I was fortunate to meet Bob Monroe at his instititue in the late ’80’s and spent a day at the Monroe Institute retreat in Virginia. They are very passionate and honest about what they do. Their website is http://www.hemi-sync.com/. Hi I wonder could any one tell me where i can buy the Equisync ballance cd, i live in dublin ireland, i cant purchase online as i do not have a credit card. I used holosync for approx. 7 years and completed about three quarters of the program,however, it had no effect on me. I would not recommend it. I have a couple of Hemi-Synch cd’s. They are good as a supplement to meditation. Love this, and I also love meditainment! I had never heard of it before, but it has really helped me to get more out of my meditation and get closer to my goal of achieving inner peace, because I no longer get so distracted by the mind chatter.